Here at Boom Online Marketing we use a significant amount of technology and software to ensure we can offer clients value for money, streamline our processes and communicate easily and effectively. 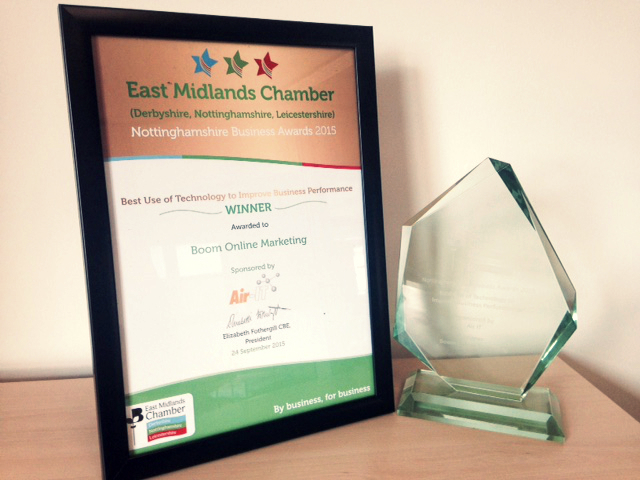 Today we’re celebrating, after being presented with the 2015 East Midland’s Chamber Award for Best use of Technology to Improve Business Performance in Nottinghamshire. The prestigious East Midlands Chamber Business Awards celebrate business excellence across Nottinghamshire, Leicestershire and Derbyshire. Winners and finalists alike gain “a true hallmark of genuine quality“, so Boom Online Marketing are proud to have been named a winner at last night’s award ceremony for the Nottinghamshire Business Awards. Twenty five companies from Nottinghamshire, twenty three from Derbyshire, and nineteen from Leicestershire were shortlisted across ten categories in each county earlier this year. Such a strong portfolio of finalists in each of the regions this year was an indication of the current success of Midlands businesses. The ‘Best Use of Technology to Improve Business Performance’ award for Nottinghamshire was sponsored by Air-IT, an award winning Nottinghamshire IT service provider. The entrants were assessed on how they had used technology to improve processes and make efficiencies within their organisation, as well as meeting customers’ needs and supporting marketing and communication objectives. Here at Boom Online Marketing we use a variety of web-based tools that between them have led to a complete overhaul of the way we manage workload and communication. The combination of these core tools has reduced the time taken to plan and measure workload by over 50%. Many hours every week are saved with these collaborative tools in terms of communicating both internally and with clients, vastly improving the efficiency of our production processes. One of the big benefits of the technology we employ is planning work for clients using a task-based system, with all team members tracking time against these tasks. This allows us to ensure that clients get value for money, understand where bottlenecks occur so that we can re-engineer processes where necessary and also to help identify training needs if it becomes clear a type of task requires further tuition. Congratulations to all this year’s finalists and winners!